Happening today, April 18th! 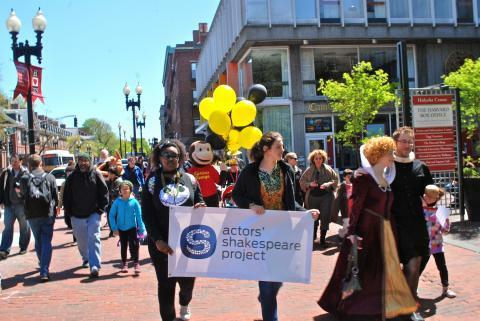 The 8th Annual Bookish Ball and Shakespeare’s Birthday Celebration is taking place in Harvard Square at noon. Check out the full roster of events here. There will be readings, there will be book-buying, and there will be cake! (Billy turns 451 on April 23rd – I will keep reminding you of this fact!). The event will end with a Shakespeare Slam at 4:30 PM at John Harvard’s Brew House. It’s a gorgeous day outside (for once), so head over to the square and soak in the festivities. Next up, on April 26, is the Japan Festival Boston. The Boston Common will be full of booths offering food, gifts, tons of information about Japanese culture generally and locally, as well as live performances. In the mood for tonkotsu ramen, or onigiri, or to listen to some live J-pop? I thought so. Starting April 27th, the Harvard LITFest is back, with some extra-special guests. You can listen to Claudia Rankine discuss her book Citizen: An American Lyric (a finalist for the National Book Award), join Matthew Weiner (the creator of Mad Men) to discuss prestige television, or sit in on a panel on the narrative of medicine and illness with award-winning poet and editor Meghan O’Rourke, Dr. Suzanne Koven of the Harvard Medical School, and Prof. Karen Thornber (Comparative Literature). Plenty to do in April, people. This entry was posted in Boston NOW, Food, Literature, Shakespeare, Theatre, TV and Film and tagged ASP, Bookish Ball and Shakespeare's Birthday Celebration, Citizen: An American Lyric, Claudia Rankine, Harvard LITFest, Japan Festival Boston, John Harvard's Brew House, Karen Thornber, Mad Men, Matthew Weiner, Suzanne Koven. Bookmark the permalink.